يوفر فندق Base Taupo ظروف إقامة راقية وهو خيار رائج للسياح ولرجال الأعمال أيضاً. يقع في منطقة مطاعم, رياضات, سياحة من المدينة. يحظى هذا الفندق ذو 4.5 نجمات بمكان ممتاز يسمح بالوصول إلى المعالم السياحية الأكبر في المدينة، فهو يبعد مسافة 1. Km عن صخب المدينة. يضفي محيط الفندق اللطيف وقربه من أكثر المعالم السياحية جذبًا سحرًا خاصًا على هذا الفندق. كما يقدم Base Taupo الكثير من الخدمات لإغناء رحلتك في المدينة. تتضمن الميزات الرئيسية في هذا الفندق: مرافق مخصصة لذوي الاحتياجات الخاصة, واي فاي في المناطق العامة, مطعم, جولات, خدمة غسيل الملابس. ادخل إلى واحدة من الغرف 42 وتخلص من عناء نهار طويل بمساعدة مجموعة كبيرة من الخدمات كمثل تلفزيون بشاشة مسطحة, سجاد, رف للملابس, إغلاق, تدفئة الموجودة في بعض الغرف. كما أن مجموعة الخدمات الواسعة الموجودة في الفندق لضمان راحتك تترك لك الكثير من الخيارات لقضاء وقتك أثناء فترة إقامتك. إن Base Taupo هو مكان مثالي للمسافرين الذين يتطلعون إلى الراحة والاستجمام في المدينة. You can't ask for too much when you pay not much. Base Taupo is close to the i-site Taupo and the Intercity bus stop. The staff there are friendly and helpful. In terms of facilities, it would be better if there were hooks on the wall for hanging clothes as well as a small table in the room. The hostel is in a great location 2 minutes stroll to the lake and and the i-site. The room we had was a double with an en-suite which had plenty of room for us. The issues we had were with the loud noise coming from the surrounding bars. Even with earplugs we struggled to sleep on the Friday and Saturday nights until the very early hours of the morning. They do provide you with earplugs, but they dont do much. The bed was also not very comfortable, the springs dug into me! Another problem was they charge $2 per tiny sachet of washing powder in addition to $4 wash and $4 dryer. They also charge $4 per day for Wi-Fi which is a bit cheeky considering that's a necessity for most people. Sadly the Base chain seems a bit money grabbing. But overall, good convenient location and decent room. Very friendly guy at reception, provided recommendations for the local area Basic but clean room, with linen and toiletries. Very close to restaurants and bars. Stayed at weekend so some noise from the street, which didn’t bother us but might do if light sleeper. Only negative no free WiFi in rooms. Overall excellent value, one of the best hostel rooms we stayed in. Agoda messed up our booking by booking us but when we got there it was fully booked. Staff was nice enough to give us a 3 person room. Since we originally booked a private queen room, he blocked our dorm room so nobody else can join us. Gave us free drinks too! Heater is a bummer since it shuts itself down after 30mins. You have to manually turn it back on to keep warm during winter. A bit of improvement on cleaning maybe.. found a wrapper of chips on the bedside. No elevator to the 3rd floor. Only up to the 1st floor. Bar across the hostel has loud bands playing and can be heard from the room. Not a biggie though. Slept our way through. I'd stay here again. Location is the best. Restaurants and lake just behind the hostel. tidy and clean but very small room. no lift. the most important is very noisy at night time till almost dawn....OMG! can't sleep at all. in fact it has a best location to the centre of taupo and just next to the lake. This hostel near to taupo lake and the coolest mcd in the world (the airplane mcd). Just a walking distance. Bathroom is clean and big. Kitchen big and nice too. Feel comfortable to cook too. We stayed in the 4 bed room with private bathroom. The room was spacious and clean. The shared bathrooms are clean as well. The kitchen has everything you need. everything was fine. But the kitchen was horrible. Super dirty. No lift there, if you have a heavy luggage, you need to carry it upstair. 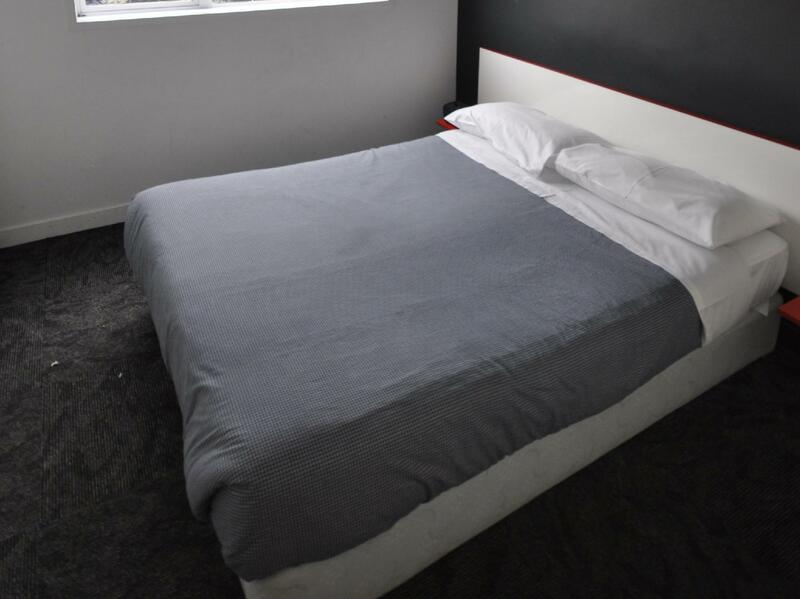 This hostel is in the city centre which is convenient. We lived in a double room and the room was quite clean, but not too large. It was quite noisy because the bar was downstairs. Also, we heard the sounds from the corridor clearly, which influenced our sleep. Some of the staff looked unhelpful too. Definitely not staying in this hotel or any of their other branches ever again. The place looks run down from the beds to the toilets. We suspect the sheets weren't even replaced when we arrived. Every base hotel has a bar next to it, so expect drunk, rowdy and loud occupants swinging and banging doors on. Wee hours of the night. If your idea of staying at a backpacker hotel is to party and hook up with people this is your kind of place. But if you're looking for a comfortable cheap place to get some good night's rest, you're much better off somewhere else. It was a very pleasant stay in the 4 female dorm and good value for money. Helpful staff. But there were no lifts for travellers so I had to carry my very heavy luggage bag up 3 floors to my room. Other than that, all are good. room was directly overlooking lake taupo, great to wake up to! great vibe, with fantastic people staying there as well. it is located right in the heart of the taupo nightlife, and other tourist attractions such as huka falls, and the hot springs is only a short distance away. Staff was very friendly and considerate. We arrived very early in the morning (3am) and we're expecting we can do early check in, but since non of the private rooms are already available and check in should be at 2pm , they allowed as to stay on one of the dorms for free before the official check in time. Also, the location is nice as it is close to restaurants and bars as well as just a stroll away from Lake Taupo. But due to this it's quite loud at night with all the partying across the street. Overall, our stay was ok aside from the fact that the sink in our toilet is clogged and also the kitchen looks dirty. Not recommended for couple or family. Awful service, kitchen is not tidy. Private rooms are very small.